Tanapag village and lagoon as seen from the ridge. Håfa adai, welcome to Tanapag. Tanapag is a village on the island of Saipan, in the Commonwealth of the Northern Mariana Islands. 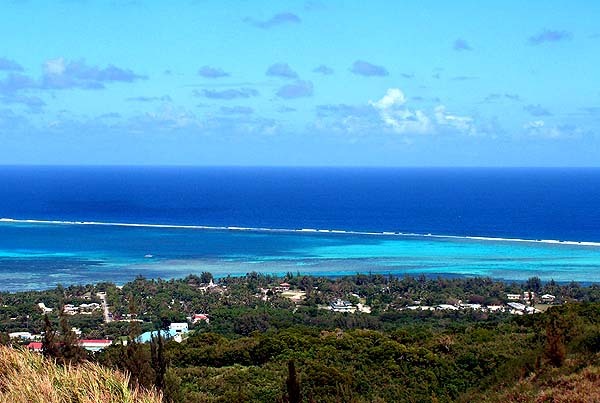 The Commonwealth of the Northern Mariana Islands is commonly referred to as CNMI, and we will use this designation. Tanapag (pronounced tah-NAH-pok) is a fishing village settled by Carolinian immigrants in the 19th century, during the time when the indigenous Chamorro population had been relocated on Guam. With their return to Saipan, Chamorros intermarried with Carolinians in this village. Today, some residents use the term "Chamo-linian" to describe the hybrid culture of Chamorros and Carolinians in the Mariana Islands. Tanapag aptly represents this blending of two traditions. Pacific Worlds welcomes you to explore this beautiful place through a series of eight thematic topics. Within each of these, you will find short, focused sections exploring particular aspects within that theme. Provided also are bibliographies and links to external sites that will teach you more about the topics discussed. Meet the community members who will guide our journey at Tanapag. Each of these people offers distinct and valuable insights into the different faces of Tanapag, past and present. Familiarize yourself with the location of CNMI within Micronesia, and find the location of Saipan within the Marianas archipelago. See where Tanapag sits on this island. From the mountains to the sea, this section provides orientation to the major physical, spatial, organizational, and cultural features of Tanapag. Go here to get the lay of the land before you arrive. Describes the journey involved in reaching Tanapag today, starting with landing at Saipan International Airport. This gives a sense of the relative location of Tanapag on the island of Saipan.